Movies and TV are so overrun with post-apocalyptic visions and dystopian society sagas that audiences should be forgiven for approaching any new attempt with at least some degree of cynicism. You know the set-up: Sometime in the near future the world as we know it has collapsed. The economy crumbled, climate change upset the environmental balance, there may or may not be an outbreak of zombies. But Australian filmmaker David Michod’s The Rover proves there’s still fertile territory to mine from a suddenly overworked subgenre. His film is as bleak and unsparing as the world’s end premise demands. It’s also utterly transfixing from start to finish and elevated by the unexpectedly superb pairing of stars Guy Pearce and Robert Pattinson. Michod has a tough act to follow here: his own acclaimed debut film, Animal Kingdom. That Australian crime family saga earned an Oscar nomination for Jacki Weaver and featured Pearce in a supporting role. This time, Pearce is the lead, and the reunion with Michod results in one of the often underrated actor’s very best roles and an affirmation of talent for an exciting new filmmaker. Pearce’s Eric is a quiet drifter in a vast desert wasteland —introspective almost to the point of invisibility. That unassuming demeanor masks a brutally efficient killing machine who fully subscribes to the “kill or be killed” philosophy that guides so many apocalyptic sci-fi heroes. There are no answers forthcoming as to what exactly happened to society as we know it, but we’re granted more information about how Eric reached his present state as the film progresses. We also meet Rey (Pattinson), a twitchy, chatty, and rather dim-witted younger man who crosses paths with Eric. The two team up to track down Rey’s scumbag brother, Henry (Scoot McNairy), who stole Eric’s sole prized possession—his car—and left Rey for dead after a skirmish with some other thugs. The Rover is a quiet film, full of mystery and dread, and takes its cues from the haunted leading man. It’s a relentless experience: from the unforgivingly oppressive environment and stifling heat of the blazing hot sun (the film was shot during the height of Australia’s summer in the remote Flanders Ranges) to the ever-present buzzing of flies and rot palpable in every location, audiences will feel as trapped as the characters in this hostile, volatile setting. It’s a truly gnarly movie, simultaneously pulling you in and pushing you away, but you can’t take your eyes off it. Credit for that is due in part to the meticulous filmmaking. Production designer Jo Ford’s subtle work will leave you seeking every available clue to find your bearing in this strange new world, aided by cinematographer Natasha Braier’s striking camerawork. The way the camera pans ever so slowly around a door—revealing new information inch by inch—or creeps down a hallway expertly sustains the story’s eerie mystery, and the sharp editing by Peter Scibberas finds a nimble balance between Michod’s deliberate pacing and knowing when to cut at just the right moment. Composer Antony Partos’s score and the sound design by Sam Petty add ominous sonic texture to perfectly compliment the visuals. The real shocker for most will be Pattinson, best known for the Twilight films but recently making a concerted effort to broaden his creative respectability by teaming with the likes of David Cronenberg, Werner Herzog and Olivier Assayas. Cronenberg showcased some of Pattinson’s potential as the cold-blooded money man in Cosmopolis, but Michod allows him to go to another level here. It’s a showy performance but one with enough nuance and vulnerability to demand attention for the right reasons. More importantly, Pearce and Pattinson work magic together. Their characters couldn’t be more opposite—one a man of few words and another who talks just to talk … the grizzled veteran and the youthful innocent. Watching them slowly find common ground is a genuine delight in a film that otherwise remains purposefully punishing. 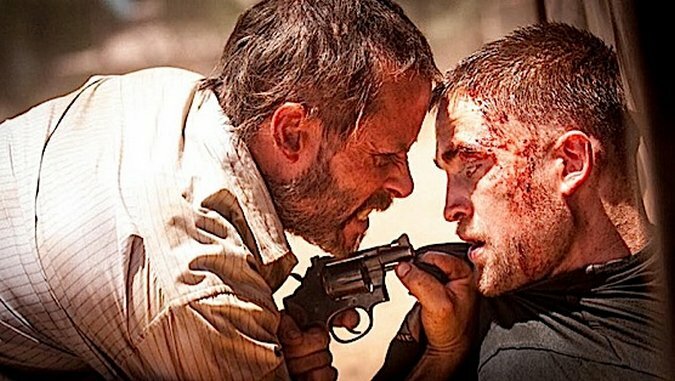 Despite its sci-fi trappings, handful of stunning (if small-scale) action sequences and a star with a proven box office track record, The Rover can’t really compete with summer’s biggest releases, and it doesn’t need to. As the latest from upstart indie distributor A24 Films (who have made quite a mark in just over a year on the scene with Spring Breakers, The Spectacular Now, The Bling Ring, Under the Skin and Obvious Child, among others), it’s the perfect alternative to flashier, noisier offerings. The Rover will be wandering the arthouse circuit most of the season, and it’s worth seeking out.